U2 frontman Bono appeared onstage for an interview this weekend at the Cannes Lions festival with Apple designer Jony Ive, and while the two spoke of their successful history together in raising money for The Global Fund to fight AIDS, Bono did take the opportunity to criticize the company for downplaying its role. The interview with Bono and Ive was summarized by AdWeek, who noted that the superstar singer used the platform to urge companies in attendance to aid his global nonprofit, (RED). Bono said that while Apple has raised more for his charity than anyone else, the company has consistently downplayed its involvement dating back to the start of the partnership involving late Apple co-founder Steve Jobs. 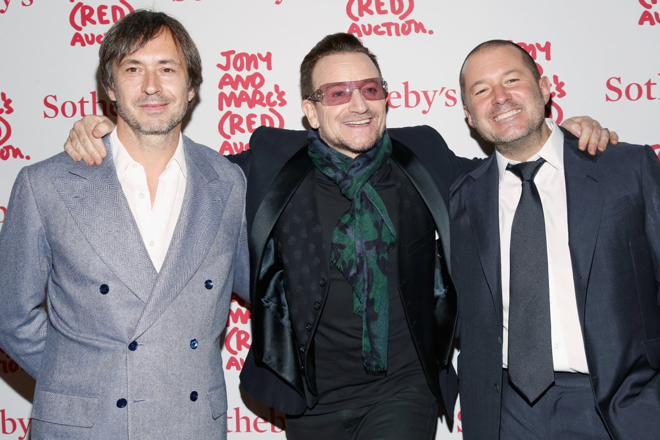 Bono went as far as to call Apple "annoyingly quiet," saying that the company doesn't do enough to tout the fact that it has raised $75 million for The Global Fund. The singer also showed off an iPad with a (RED) Smart Case, and criticized Apple for only promoting the charity on the inside of the cover, where it will never be seen when attached to an iPad. "This is modesty run amok," Bono said in front of Ive. "This is the Apple way. They're like a religious cult." For his part, Ive noted that Apple has partnered with (RED) since 2006, when its first (RED) product, an iPod nano, was released. The company's lead designer noted that Apple now sells "well over a half a dozen" items that contribute money to The Global Fund, and characterized the partnership with (RED) as "really, really special for us." The (RED) charity revealed in April that Apple had contributed $70 million to the program to date. The iPhone maker has raised more than any other company for The Global Fund to Fight AIDS, Tuberculosis and Malaria. And while Bono was critical of Apple in the appearance, he has publicly praised the company and Jobs in the past. In 2011, Bono penned an editorial defending Jobs and his contributions to charity. Last year, Ive and Bono teamed up with fellow industrial designer Mac Newson to design several one-of-a-kind products for a (RED) benefit auction. Items included solid rose gold Apple EarPods, a red Mac Pro, and a completely custom Leica Digital Rangefinder. The Mac Pro went for nearly $1 million, making it the most expensive desktop PC ever built.